TRIVIA of Noh : Q19 : Is it true that Noh music does not have definite tonality? | Home | Trivia | Q19 : Is it true that Noh music does not have definite tonality? Is it true that Noh music does not have definite tonality? 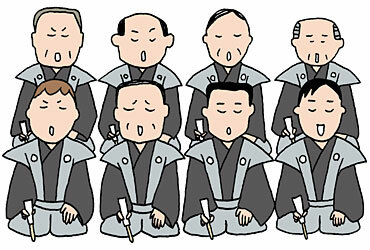 Noh music begins with a chorus of 6 to 10 reciters (jiutai-kata; from the same school as shite-kata). The sense of unity created by the chorus makes the Noh play doubly impressive. The chorus is led by the principal reciter, jigashira. He is responsible for putting the voices in unison in consideration of the scene, the music, and the acting of shite (the lead part) and waki (the supporting cast). Noh scores indicate changes of pitch and relative ranges of the voices, but they do not indicate any definite tonalities of the music. The reciters sing in their own tones. The unison let you feel a unique depth of the music, but it is not necessarily in harmony. You can feel the sense of unity because the chorus is led by the principal reciter. You will enjoy plays even more if you pay attention to the unity created by each member of the chorus under the leadership of the principal.